Harakeke Gardens Guesthouse offers luxury accommodation with beautifully landscaped central courtyard adjoining main house, screened for privacy with own private outdoor living areas on the north side of guesthouse. 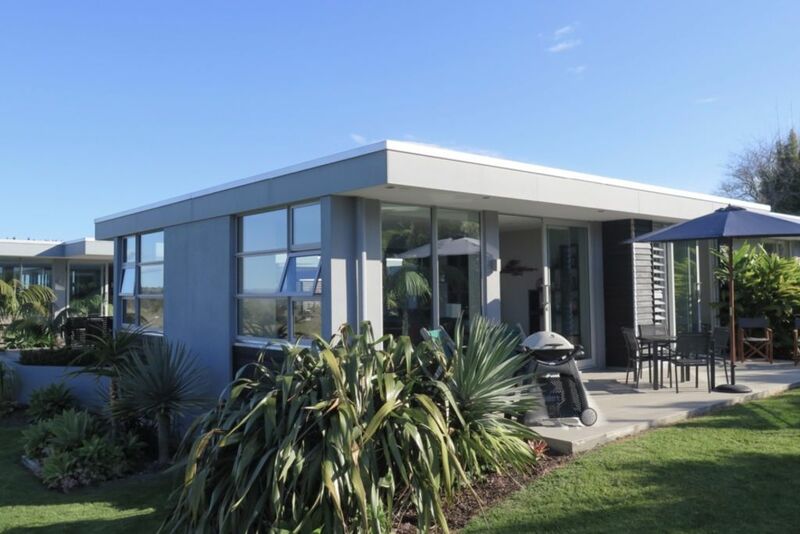 Surrounded by a private garden with an abundance of native New Zealand flora and fauna. Harakeke Gardens Guesthouse is purpose built and very well-appointed. You will be able to relax, indulge and pamper yourself here. Only minutes to the centre of Kerikeri with its top cafes, boutique shopping galleries, award winning restaurants and vineyards, Farmers and Growers Markets and much, much more. . Ample room for parking your boat and easy access to the Bay of Islands. Dive for scallops, crayfish or gather mussels from the Black Rocks. For those of you not into boating make Harakeke Gardens your base to explore the magic of Northland. Visit the historic Stone Store and picnic by the river or walk the scenic track to Rainbow Falls. Check out the giant Kauri and walking tracks in the Pukekti Forest or safe swim in deep water at Opito Bay, only minutes down the road. Visit the local river swimming spots of Charlies Rocks and Fairy Pools. Drive 25 minutes to Paihia and catch the ferry to historic Russell. Visit the Hokianga, or closer to home Whangaroa Harbour, Tauranga Bay, Matauri Bay and beautiful Te Ngaere for surf, sun and diving. Only a 25-30 minute scenic drive away. Or simply relax and drink in the peaceful rural scenery and surrounds in comfort. There is a well stocked library and CD collection for you to enjoy at your leisure and we encourage you to help yourself to complimentary fresh seasonal vegetables grown on site. For anyone looking for a home away from home to holiday, relax and enjoy with friends or family, whatever the season, Harakeke Gardens Guesthouse offers the ideal luxury accommodation you have been looking for. Owners on site with an abundance of local knowledge. Children over 5 years old only. Complimentary fresh seasonal vegetables grown on site. These guests were friendly, and left the guesthouse in a clean and tidy condition on leaving. Had an amazing 4 night stay in this beautiful house. It was very well appointed and very comfortable. Jan was very friendly and helpful. I celebrated my birthday whilst there and she very kindly gave me a card and gift 😁�. The surrounding garden is lovely and we were able to cut fresh lettuces which was an added bonus. We also took advantage of the barbecue and the spacious very comfortable patio area. Enjoyed the company of the sheep and cows in the adjoining fields and plenty of visiting birdlife. We did enjoy having Marilyn and family to stay at the guesthouse. They were excellent guests, friendly and respectful and we would have no hesitation in welcoming them back to Harakeke Gardens Guesthouse again. Simon, Simone and Madison Jackson were a pleasure to have stay at our guesthouse. It's great to know their stay was enjoyable and the accommodation and all the little extras were appreciated. We would certainly welcome them back again. Perfect guests who made the most of staying at Harakeke Gardens Guesthouse and took advantage of beautiful Northland and much that it has to offer. On departure they left the property clean and tidy. We look forward to seeing them again. I can't say enough good things about Harakeke Gardens! I can't say enough good things about Harakeke Gardens! The cottage and landscape surrounding it are absolutely gorgeous. It was immaculately clean and all the amenities we could need for our stay were amply provided. There is even a garage for our car to park in. I must say we were sad to leave this place and if we return to New Zealand we will definitely stay here again! Such a nice location with amazing views. Such a nice location with amazing views. Always clean and well supplied with kitchen, bathroom, laundry and bedroom needs. Beds are so comfortable! A beautiful property in an equally beautiful setting. A beautiful property in an equally beautiful setting. Great facilities, and very high standards of finish and cleanliness. Stunning views in a peaceful rural setting.